The governance structure of RES URBIS must ensure smooth implementation of activities, accomplishment of objectives, development of high quality deliverables on time, exploitation of project results and of its portfolio of products, and finally effective dissemination at various audience in different countries. The project will be led by the Project Coordinator (PC), Prof. Mauro Majone of Sapienza, University of Rome, who will be responsible for the overall coordination of RES URBIS, especially but not limited to the scientific point of view. For the management of the Project, Prof. Majone will be supported by a specialized in-house team (Management Support Team, MST) based at the Grant Office of Sapienza University. Executive and operative level focusing on activities will be implemented through WPs to realize the defined strategy (Work Packages). Steering level, involving external monitoring of project activities (Advisory Board). The strategic level of the consortium is represented by a General Assembly (GeAs), consisting of one representative for each participant and a Strategic Committee (SC) consisting of WP leaders. The SC will be the main decision-making body and in charge for strategic conduction of the project whereas GeAs will be called for formal decisions which require that all partners express their vote. In order to optimize procedures and validate the work, the GeAs and the SC will also rely on an external steering level, exerted by the Advisory Board (AB), which will consist of people who are internationally recognized as experts in the scientific and technical topics of the RES URBIS, namely waste/wastewater management or bio-based plastics. 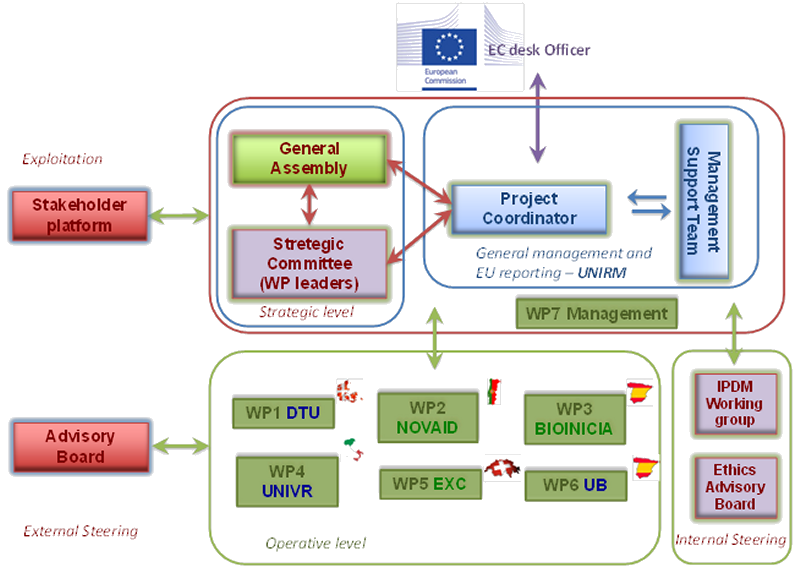 The operative structure for the scientific and technical management of the project is based on seven Work Packages, each led by a WP Leader (WPL), who will coordinate and monitor the activities taken within that specific WP. The WPLs will be responsible to coordinate their own WP in collaboration with its participants. WPLs will monitor the progress of their WP and will report to the PC and the SC.